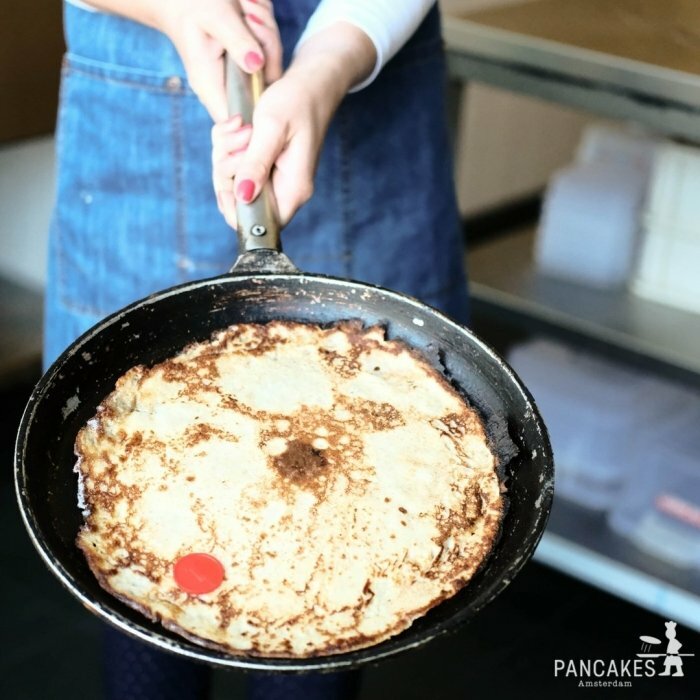 PANCAKES Amsterdam is very proud to tell you that we serve lactose-free pancakes. PANCAKES Amsterdam offers lactose-free Dutch pancakes. Unfortunately, we do not serve gluten-free American pancakes and Poffertjes. Nevertheless, we have an amazing variety of lactose-free Dutch pancakes and the PANCAKES Amsterdam taste is still guaranteed. Our lactose-free pancakes are gluten-free as well. So if you order a lactose-free pancake at PANCAKES Amsterdam, your delicious Dutch pancake will also be gluten-free. PANCAKES Amsterdam offers gluten-free, lactose-free and vegan pancakes. Wanna find out more? Click on the link! Lactose intolerance is the inability to digest lactose. This is a sugar that can be found in milk and dairy products. A lactose-free diet means eating foods that do not contain lactose, Lactose intolerance is caused by a lack of the enzyme called lactase in the small intestine. Our lactose-free pancakes are also gluten-free and they are made with soy milk. So, our gluten-free or lactose-free guests can also enjoy our delicious pancakes. When you order a lactose-free Dutch pancake, please make sure you tell our staff that your pancake must be lactose free and also make sure that they order a lactose-free pancake for you. The preparation of lactose-free pancakes takes a little bit longer but this gives you more time to socialize with your family or friends. When your delicious lactose-free pancakes arrives make sure there is a chip on your pancake like in the photo below. This chip is a clear sign and an easy way to recognize your special gluten-free, lactose-free or vegan pancake, . And that our chefs have done their absolute best to prepare a lactose-free pancake, however PANCAKES Amsterdam cannot guarantee that our products are totally free from allergens. This is because we are a pancakes house and we work with products that contain gluten. If you have any questions please ask our staff, they will be happy to answer them. We serve several gluten-free, lactose-free and vegan Dutch pancakes. Just ask our staff. ;) Or just take a look at our menu. Did you know we also sell our homemade pancakes mix and gluten-free pancake mix? Our pancake mix is especially made for and by PANCAKES Amsterdam. If you add soy milk instead of normal milk, your pancake will be lactose free! Would you like to know more? Just check here. Our own gluten-free pancakes mix contains several ingredients. The ingredients are: corn starch, teff flour and buckwheat flour. Our lactose-free pancakes are lactose and gluten free. PANCAKES Amsterdam offers gluten and lactose-free pancakes in all of our restaurants. So why don't you not come and visit us? If your question still has not been answered, please do not hesitate to contact us. You can always send us an email or contact us through Instagram or Facebook.